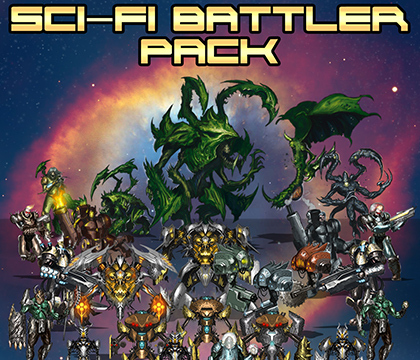 Sci-Fi Battler Pack | Create Your Own Game! Are you on the lookout for some incredible battlers to use in your futuristic and science-fiction games? Look no further! 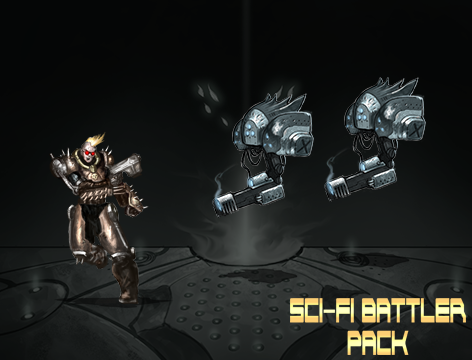 Sci-Fi Battler pack is filled with androids, aliens, and sophisticated machinery - the essentials you need in your space adventure. Hand-painted by Michael Rookard, this pack is a perfect companion to his Sci-Fi Battlebacks. Hand-painted battlers, sized for use in RPG Maker. 25 Battlers, ranging from smaller enemies to large bosses. Aliens, androids, robot weapons, mutants and more. Royalty-free use in your RPG MAker/IGM projects!